Rubber Room Ramblings: HOLIDAY STAMP-A-STACK SNEAK PEEK! 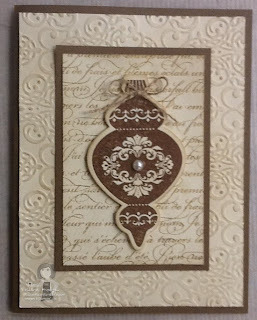 This is one of the cards we will be making during the Rubber Room Holiday Stamp-A-Stack on September 26th. I love the vintage look of this card. Still debating whether or not I should do a little distressing? For the little bow at the top of the ornament, I used the 1 1/4" Burlap Ribbon (available in the Holiday Mini Catalog) and just cut the finished edge off and pulled one of the strands out, then tied it into a bow. For the Very Vanilla background, I embossed it and then sponged some Crumb Cake ink on top of the embossed image. 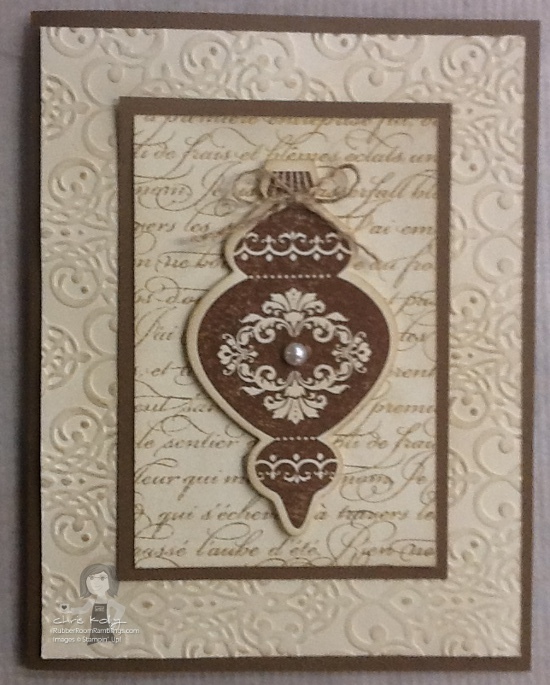 I used the Enfrancais Background Stamp and the Ornament Keepsakes Stamp Set with coordinating Framelits. The base of the card is Soft Suede. ORDER YOUR ORNAMENT KEEPSAKES STAMP SET HERE!